We made this jerky for Steak Lovers! Do you like eating a succulent steak from an Asian Steakhouse? 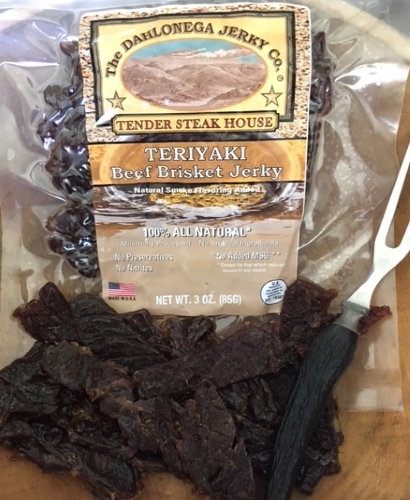 Then Dahlonega Jerky Co. Tender Steakhouse Teriyaki Brisket Jerky will satisfy your craving! Flavor – first you’ll taste a mellow teriyaki sweetness, followed by a savory hickory smokiness. Chewing texture – soft, moist, tender meaty chew jerky. Dahlonega It’s Pure Gold is our town motto. To celebrate our rich history, we have created this gift box filled with five of our Dahlonega Jerky Co. best sellers! A remarkable selection of delicious flavors! Are you craving a variety of Beef and Turkey Jerky flavors? Try our Traditional Jerky sampler. 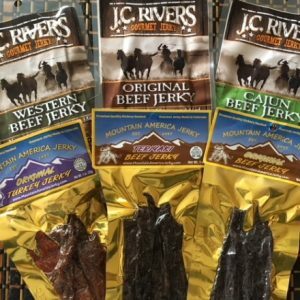 It’s a collection of our 6 most popular flavors of Beef and Turkey jerky. Enjoy a variety of slab cut and strip cut slices of whole muscle meat. 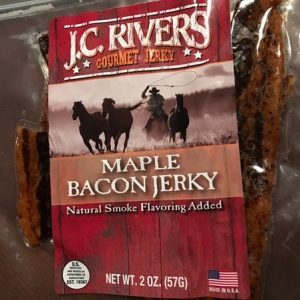 JC Rivers Maple Bacon Jerky is a gourmet jerky, handmade in small batches every day, this jerky is always fresh! Flavor – smoky bacon with a prominent maple syrup sweetness and mild heat. 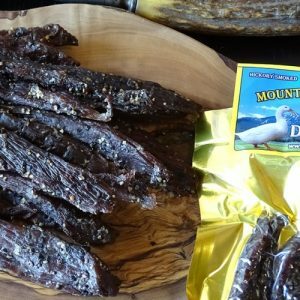 Mt America Teriyaki Beef Jerky is a gourmet jerky, handmade in small batches every day, this jerky is always fresh! Flavor – An Asian teriyaki with the perfect proportions of salt, pepper and sweet.